Reading with your child is one of the best ways to improve your child’s speech and language skills. This post will highlight a few books that are age-appropriate for toddlers and preschoolers that can be used at home to increase your child’s speech and language skills—even if they don’t have any speech or language related problems. Appropriate for children ages 2-5, toddlers - kindergarten. This book is full of repeating lines, and that’s an opportunity for your child to predict and interact with the story. Encourage them to help you finish that repeating phrase (ex: Looking at me!) by pausing and allowing them time to complete the phrase. This book is a great opportunity to engage your child by allowing them to be silly and make animal noises and act out the animal movements! Appropriate for children ages 1-4, toddlers - preschool. This is a lift-the-flap book that encourages your child to engage with the book! It has a repeated line (“I sent him back”), which encourages your child to predict the words! It’s also a great opportunity to practice animal noises and teach animal vocabulary. Appropriate children 3 and up. This is a great book to teach vocabulary and sequencing. As with our other books, this encourages your child to interact with the story. Have them look at the pictures and help you tell all the food the caterpillar is eating! This is a touch and feel book that has a puppy on every page with a different texture. Encourage your child to interact with the book. Practice answering yes/ no questions (ex: do you like how that feels) and use descriptive vocabulary to talk about how each puppy feels! There is a mouse on each page that you can find and show with a pointed finger! Click here to contact Oak Tree Development Center. Play has a beneficial role in every child’s growth and development. Play allows a child to be able to use their creative senses in order to connect with the world around them. Playful interactions can foster new skills such as fine motor, gross motor, and executive functioning skills. Certain play can increase a child’s physical activity, making it an important part of a healthy lifestyle while combating unhealthy choices and building healthy bodies. Play also enables children to develop emotional regulation skills such as coping mechanisms, impulse control, and sharing skills. Through play a child is able to master their world while conquering their fears. Children learn how to work with peers while negotiating and resolving conflicts. When a child is able to direct the play, he or she can practice important life making decisions that will carry over into their adult years. Play is a key component to the therapeutic relationship between a child and the occupational or behavioral therapist. Play in therapy allows a child to enhance learning readiness, attention span, and problem solving skills. In fact, according to research by Dr. Karyn Purvis, scientists have discovered that it takes approximately 400 repetitions to create a new synapse in the brain, unless it is done in play, in which case it only takes 10 to 20 repetitions. Whether it be board games, crafts, puzzles, or imaginative games, a child is always learning. For learning to occur in play, it should be done in a stress-free environment and it should be meaningful for the child. It is important to foster the development of skills in play in order to help children reach their full potential. Occupational Therapy Can Target Many Important Skills While Teaching Children To Bake! In need of something to do with your children in the cold winter months? Warm up your ovens and do some baking! Occupational therapists are always stressing the importance of carry-over of skills in the home, as well as increasing a child’s ability to function as independently as possible. Baking is an activity that addresses many “OT skills” in ways you may not have thought of. For example, your child will be working on their problem solving skills, bilateral coordination (using two hands together), sequencing skills, manipulating tactile input, hand strengthening, hand-eye coordination, and simple math. All of these skills can be practiced while making long lasting memories of baking with your child. Bonus, there is a yummy treat waiting at the end! Problem solving skills: You can address this skill by having your child pick out the ingredients at the grocery store. Have them first look in cabinets and decide what ingredients are already in the house, and which ingredients need to be bought. Bonus handwriting task: have your child write a list of ingredients to buy at the store. 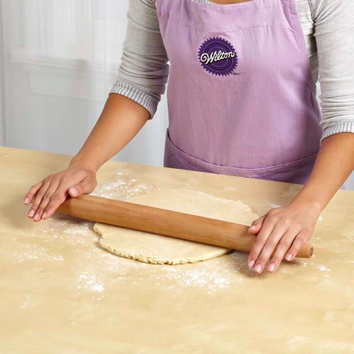 Bilateral coordination skills: Using a rolling pin, holding a bowl with one hand and stirring with the other, even rolling dough into balls are all ways your child will be using both hands together to complete a task. 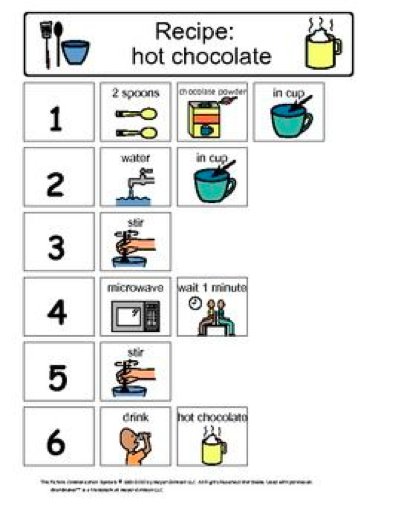 Sequencing skills: Baking is a special kind of science; a recipe must be followed in the correct order, or your treat might not turn out right. Create a checklist for your child to follow step-by-step directions. 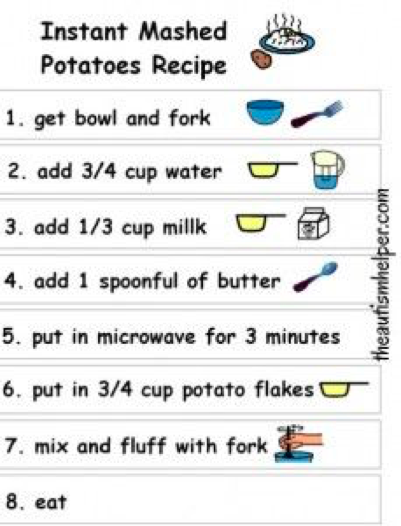 Manipulating tactile input: Have your child use their hands instead of a wooden spoon to mix together dry ingredients. Using your hands to knead dough is gooey texture that children are not exposed to on a daily basis. If your child is sensitive to tactile input, ensure then they are able to wash their hands as soon as they are done. Feel free to use latex-free gloves for those that are extra sensitive. Hand strengthening skills: Hand strengthening does not always have to be tedious and boring. Using a fork/whisk to whisk eggs, using a spoon to mix wet and dry ingredients together, and kneading dough are all ways to make hand strengthening a bit more fun. Hand-eye coordination: Having to pour ingredients or batter takes more skill than you think; if you miss you may have a big mess to clean up! Using icing to decorate cookies is another great way to practice hand-eye coordination. Simple math skills: I bet you never thought about using math while baking! Using measuring cups and measuring spoons, as well as counting are simple ways to incorporate math into your baking experience. One of the best benefits of using baking as a way to incorporate OT skills into your daily routine is having that reward of eating what you created. Now go find your favorite recipe, or try out a new one! Watch this video for a quick overview of our services.